What goes on at a Great Legal Marketing conference? We often think that a weekend just isn't enough time to fit in all the information we're going to give you at the next Great Legal Marketing conference. While other legal marketing conferences pad their schedules with "breaks" for golf outings or ice-breaker games, we've got way too much useful information to give you to waste your time with those things. At every Great Legal Marketing conference, you're going to hear stories and strategies from some of the top minds in the legal world. Some of our presenters are lawyers themselves who, like me, were frustrated and unhappy with their practice and knew there had to be a better way. Others aren't even in the legal profession, but their success methods translate to any entrepreneur who wants to make a change for the better in their business. unwilling to work hard to improve your practice and your life. looking for a 1-step fix to all your marketing problems. content with the same marketing rut you've been stuck in for years. in denial that the marketing world is increasingly reliant on the Internet. unwilling to change the way you think about the business side of practicing law. blaming the economy, insurance companies, judges and others for the shortcomings of your practice. unwilling to invest time and money in websites, marketing, and coaching programs. We cater to lawyers who are driven to succeed and grow their practice into one they can not only be proud of, but one that lets them still enjoy their own personal lives. If you're not ready to hear the methods that have worked for hundreds of successful lawyers, I'm sure you can find a legal marketing conference that will tell you the "easy way" to do things (and believe me, easy doesn't equal effective). If I haven't sold you on this conference yet, take time to re-read all the great things the Great Legal Marketing conference has to offer. You get professionals who have been in your shoes and managed to turn their practices around. 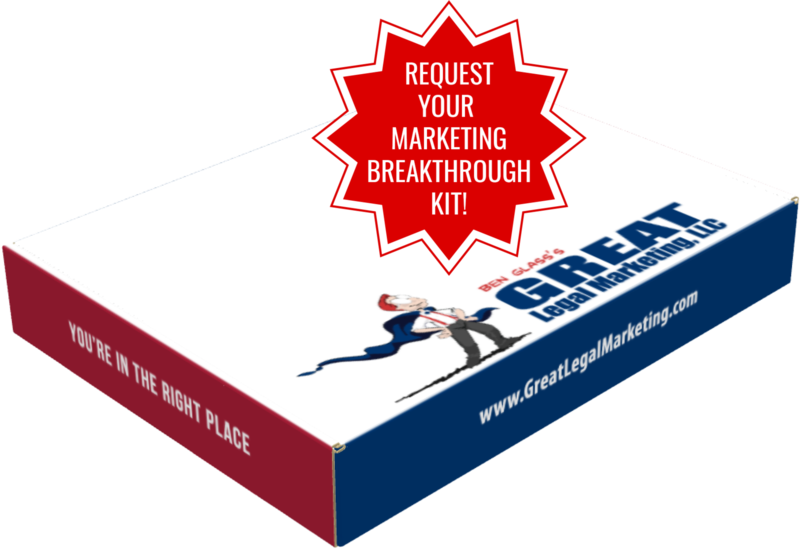 You get materials found nowhere else that spell out the steps to legal marketing success. You also get my personal guarantee that if our seminars don't knock your socks off, you get a 100% refund. The Great Legal Marketing website always has the latest information on when, where and how to get involved in out next legal marketing conference. Right now, we're gearing up for our June 2010 SuperConference in Fairfax, VA June 11 to 12 at the Fair Lakes Hyatt. We've sold out our last 5 live events, and we're already more than 50% booked. Registration is easy online and if you have to cancel and do so before May 11, you'll get a full refund. After that, your payment will be credited to a future Great Legal Marketing conference or event. If you don't want to wait until June to get started, you can still take advantage of our FREE CD and report offer to learn more about my Great Legal Marketing strategies - (703) 591-9829.